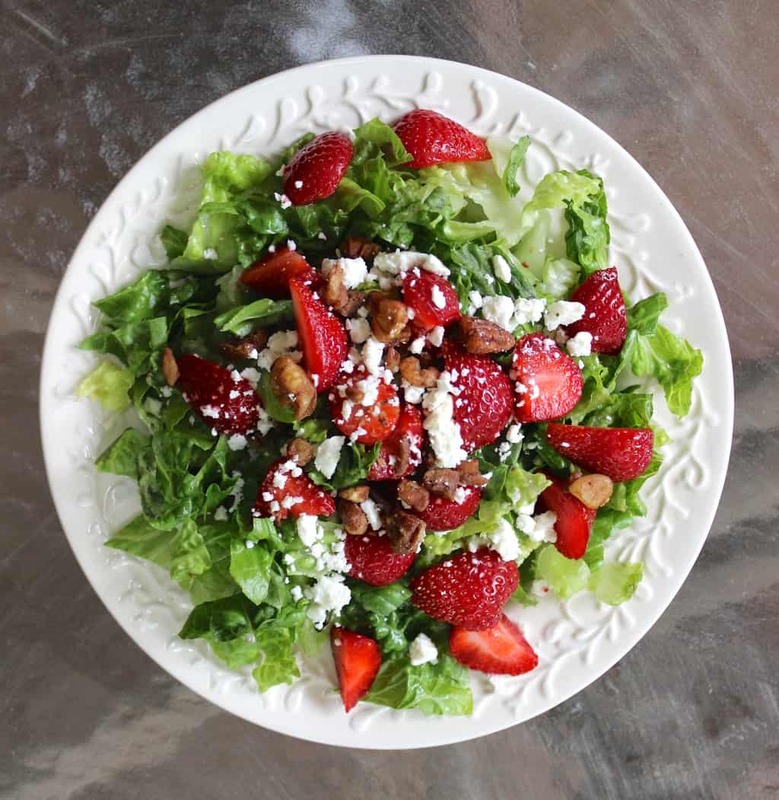 This strawberry salad with poppyseed dressing includes fresh, juicy berries, feta, & pecans atop crisp lettuce, and it’s drizzled with a sweet dressing, perfect for summertime. I’m still in New York City, and I look forward to doing a life catch up post soon! For now, enjoy one of my favorite light summer recipes. 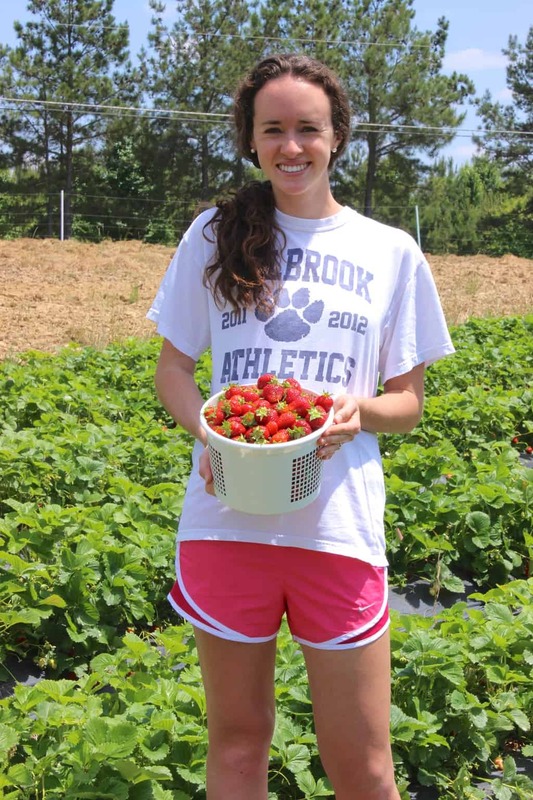 A couple weekends ago, my mom and I went strawberry picking. We left with about 10 pounds of fresh, juicy strawberries, and we knew we needed to use them fast since they were perfectly ripe when we picked them. We tossed around a few recipe ideas like strawberry shortcake, strawberry pie, and strawberry bread, but ultimately decided to take a healthy route and make a big strawberry salad with poppyseed dressing, feta, and pecans. It’s a great appetizer, and if topped with grilled chicken or another protein, it makes a great main dish, too. The salad is topped with a sweet poppyseed dressing that takes it to the next level of deliciousness. I’ve made the same salad in the fall with thinly sliced apples or pears, which is also wonderful. For now, the strawberry version is perfect for summer! Place lettuce in the bottom of a serving bowl or distribute among individual plates. Top with strawberries, pecans, and feta cheese, to taste. Toss with dressing just before serving, or serve dressing on the side. For the dressing: whisk all ingredients together and mix again just before pouring to re-combine the oil and vinegar. This just screams summer! Love it! Beautiful pictures Liv!! I loooove strawberry salads, especially in the summer when the strawberries are fresh & in season! You had me with every word in this recipe title! I’m a hugggeeeee fan of any eats that fit into the summer mentality and this light salad fits the bill perfectly! Not to mention that poppyseed dressing is probably one of my favorite things in the world… <3. LOVEEE! I love sweet salads! Especially with feta, and poppyseed dressing is the best on them, but I’ve never made it homemade. I’ll have to try your recipe for it! I love that you and your mom went picking. I would love to do that sometime. I love how versatile this recipe is. If you don’t have strawberries, you can use other fruit. This is a great idea! I missed your post when you said you were going to NYC, but GIRL. Why didn’t you tell me!? I mean, you have stuff to do, but that’s so cool that you’re here! And this salad looks so refreshing and tasty! Ahhh so sorry for not mentioning I’d be in NYC! We leave tomorrow and have had almost no free time so I knew I wouldn’t be able to make plans to see people or anything while I was here! Swoon. This looks so good! My favorite restaurant has a salad just like this with grilled salmon on top and its to die for! Oh wow, that salad sounds incredible! I posted the other day about never being a fan of fruit in salads until I tried strawberry and balsamic together. This is such a summer salad! Strawberry and balsamic sounds so good! Nothing better than pecans on salads! My favorite addition. You can vacuum pack strawberries and freeze them, but this recipe sounds great. First off, YOU ARE GORGEOUS! 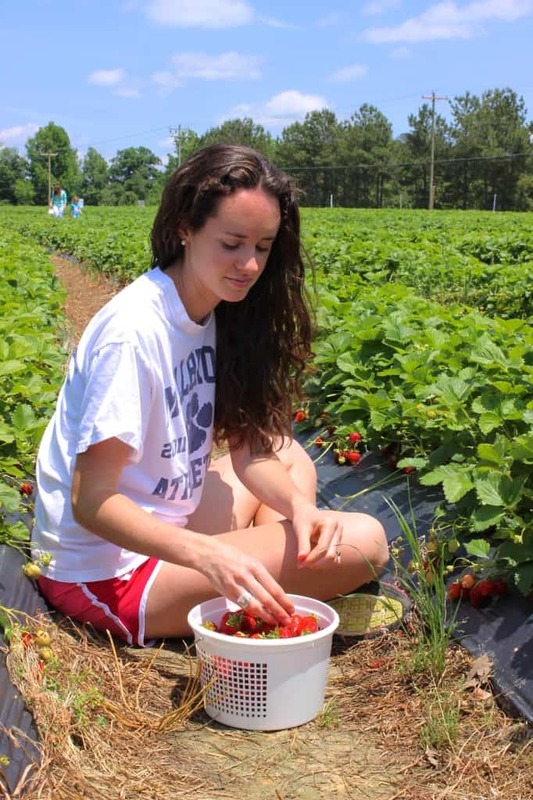 I absolutely love picking strawberries. They taste so much better when they’re fresh from the field! Also, I LOVE strawberries in salad. It feels like such a summery thing to eat!! You’re so sweet, Katherine! And I agree 100% about fresh strawberries- nothing better! After picking them, it’s a lot harder to go buy them at the grocery store now haha. Liv! Sorry but during these months I’ve been extremely busy.. But I am back! Wow! It looks amazing.. I love salads with fruit: in Italy we habe a very special kind of salad with pomelo, orange and lettuce… But I don’t really like it ’cause I can’t stand the flavour of citrus in salads. 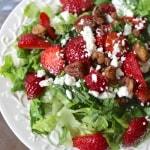 Your strawberry salad sounds AMAZING!! Great salad! Simple yet full of flavor. Dressing is an amazing compliment. I’ve added some of my own ingredients to make it more of an entrée salad or served with a BBQ – both are now family favorites! I’m so glad to hear you enjoyed this recipe- this is still my favorite summer salad! I’m making this salad again for company tonight. We loved it so much last time. It’s very quick and easy to make. I like that honey is used in place of sugar like most poppyseed dressing recipes. I also added clementines. Thank you for the recipe! I’m so glad to hear you enjoyed it! 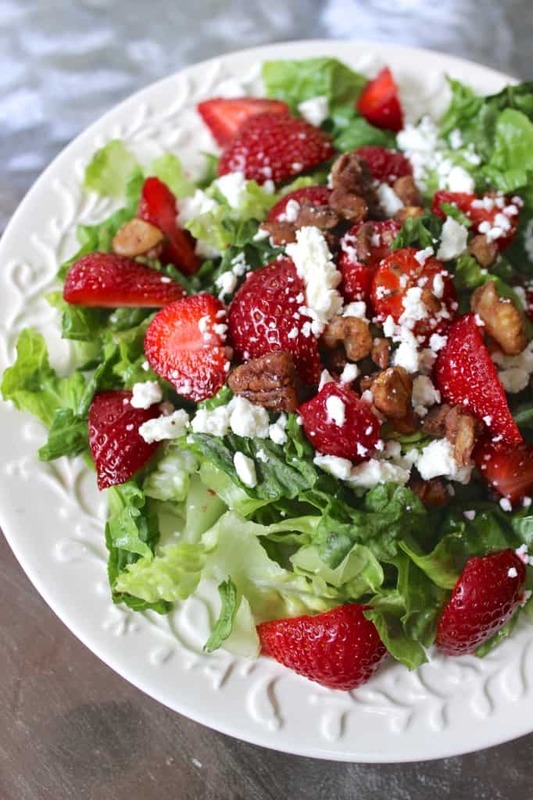 I look forward to strawberry season every year just so I can make this salad! I have recently made this for a group of friends’ get-together and they all enjoyed it! Thanks a bunch for the recipe Liv! I’m so glad you all enjoyed this salad, Kristina! Hi! I love the way the salad looks I can’t wait to try it! I was wondering if you could suggest any substitutions for the pecans? I would try it but I’m allergic to them. 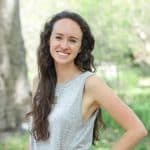 Hi Katherine! If you can have other nuts, almost any nut would work well here, like almonds, walnuts, or chopped Brazil nuts! Hi, thanks for sharing this recipe. Do you have any idea what to put instead of red wine vinegar? You can substitute cider vinegar, rice vinegar, or white wine vinegar for red vinegar! This salad was amazing! My family loved it. I substituted almonds for the pecans and it turned out wonderful. Can’t wait to make it again. Thanks so much!